Enter the kettlebell. – Dirty wet dog , boats and sailing. If anyone knows where i have blatantly ripped-off that line from i will be greatly surprised but before anyone gets annoyed i will admit that it was Pavel Tatsouline and i have at least bought and read the book. The relevance here is that i am putting one of my ‘bells’ on board tomorrow as part of my anchoring system and once i am in the flow of sailing and anchoring i will get the pictures and show how i use the KB when anchoring. For those in the know i have used a kettlebell as an anchor ‘chum’ or anchor ‘angel’ and very successfully too. I started using an anchor angel with my last boat, the Frances 26, because she had an odd propensity to wander around at anchor even when on really good gear and a significant amount of chain out. I don’t know quite what the problem was except that the semi-long keel seemed to be very influenced by any tidal flow at all and also affected by any wind acting on any resistance forward : for example with my on-deck genoa stowage. 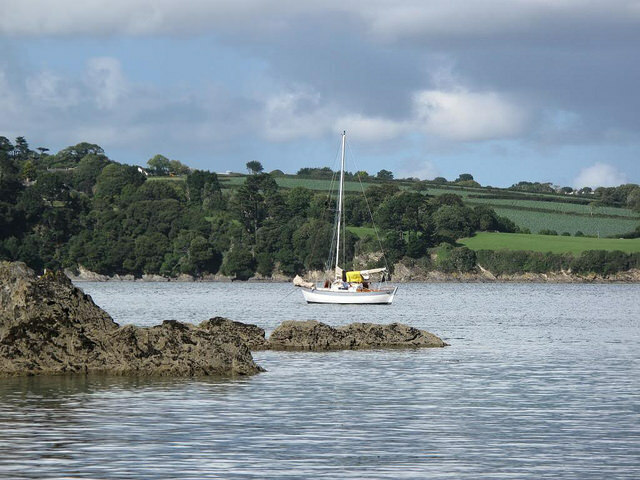 The title picture is of WABI” (Frances 26) at anchor in the Helford passage during a west country cruise, i wanted to keep her pretty tightly in one spot as there were several other yachts anchored nearby and others coming and going. My solution was to anchor as normal on the 10kg Delta with 15 metres of chain out and then warp as needed (i hadn’t moved up to regularly using the 15kg anchor) and then i lowered a 16 pound kettlebell down the warp on its own line as an ‘angel’. Any wandering stopped almost immediately so it became a regular tactic when i wanted to get the boat in one spot and keep her there…i later solved the wandering problem at my regular spot in Dandy hole by learning to bahamian moor. In a later post i will show how i manage each technique but for now the smaller of my bells is going aboard to be used as an anchor weight : in my experience so far they don’t just slow down the wandering and shearing at anchor but also do make the anchor more effective, i would say better than chain. When i get the time i want to initiate a discussion here about some of the things that i have found out about anchoring and that one of those is that all warp anchoring is a viable technique but one that is made even better with an anchor angel to really pin down the catenary curve.